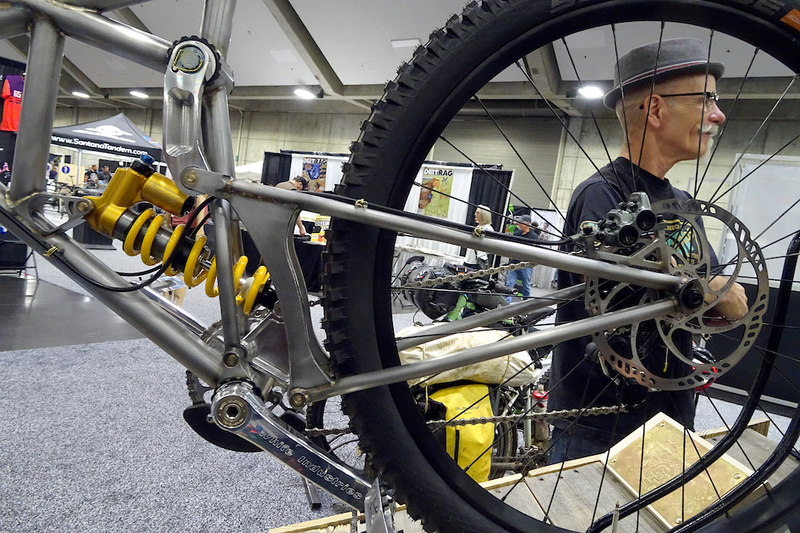 Chris Fedor, Vice president of Cal Poly San Luis Obispo's Bike Builders club, details how a bike made by 21 students could be successfully completed. In my experience, adding more people to the creative process simply adds more problems. The Cal Poly Bike Builders club may have proven me wrong. 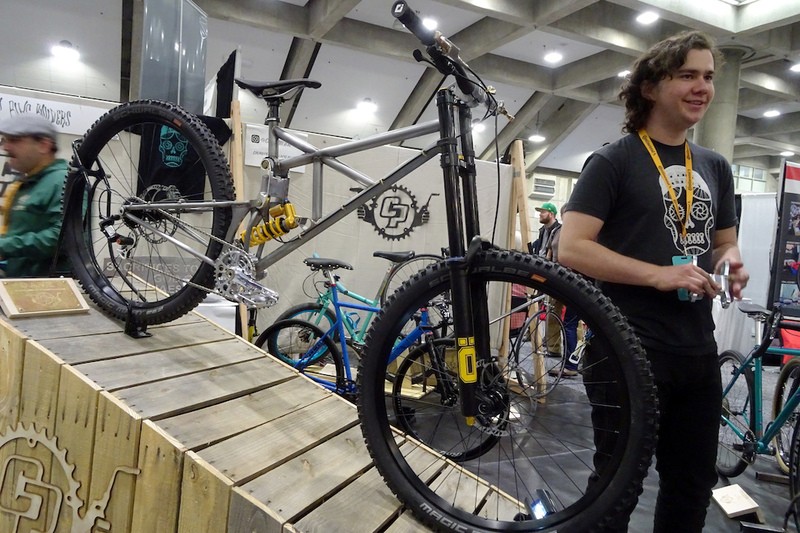 Their steel framed downhill bike is so far, my favorite from the North American Handmade Bicycle Show. My first compliment is that the team designed the bike with relatively slender tube diameters. Steel's density is too great to allow for excess in the name of fashion. Modern builders who have grown up with fat-aluminum or carbon pipes typically overbuild their frames because they "look right." I also liked the box section swingarm reinforcements. I would have gone even lighter, but the concept is well executed. The design is intelligent and the team didn't fall prey to the steel-is-real idealism. They used aluminum in places, like the rocker arms, where steel simply isn't the right choice. Chris Fedor, the team's manufacturing point man, credited project leader Shaw Hughes for the DH bike concept. Fedor said they took on the hardest project that they believed the team could complete over the school year. The design was decided upon, and then ferreted out using CAD and FEA programs that you or I could only dream to afford. The build was then divided among the club, who acted as subcontractors on the job. They split up, programmed CNC machines, fabricated the bits and, ultimately, everything fell together when the time came for welding and assembly. No doubt there were a few glitches along the way, but you'd never know it by looking at the completed bike. Well done, Cal Poly Bike Builders. Stainless steel filler rod makes the weld beads contrast against the chromoly steel. 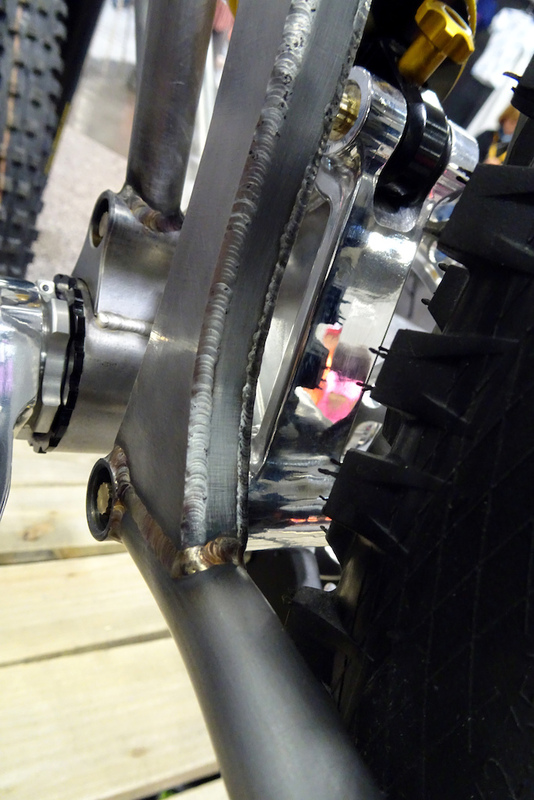 Swingarm uprights are welded box sections to help minimize weight. 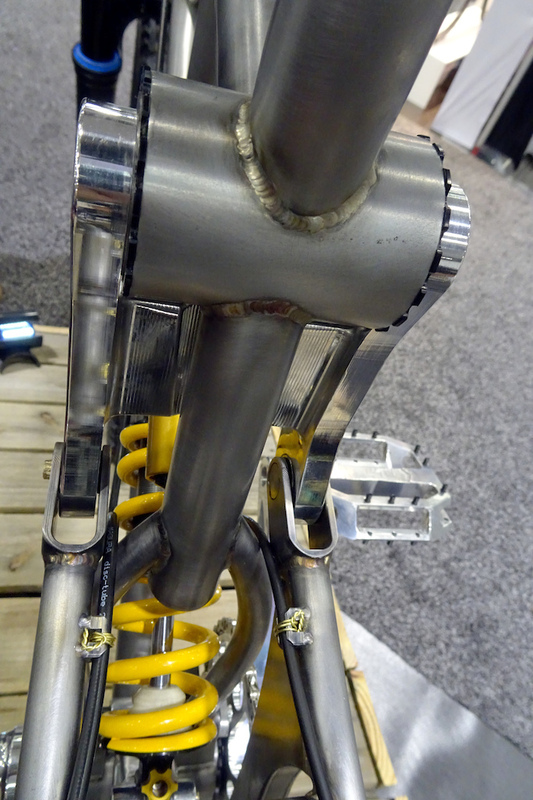 Both rockers of the dual-link rear suspension are machined from aluminum. Clevis type seat stay junctions are best practice with steel frames. Brake caliper mounts were moved inboard. ... and they even created their own pedals. The Cal Poly Bike Builders Club. Good work, impressed that they also made the master cylinder and lever. I didn't get to work on anything as interesting when I was at uni outside of choosing a dissertation I was interested in. I feel that some students really miss out on any practical side of engineering, however 'simple' and it can lead to engineers designing products that are difficult / impossible to manufacture as they lack awareness of what is / isn't possible. how many "engineers" does it take to copy an obsolete V10 ?? It's awesome that they offer the Singletrack Vehicle class as an elective. One of my biggest regrets (other than not riding more while I attended school there) was not taking this class! You just hit the nail on the head with the biggest issue in engineering, generally speaking there is definitely a lack of hands on experience and understanding. Believe me I support your opinion that engineers miss some stuff. But I can imagine fitting a torque wrench in somewhere being way down the list of importance compared to some bonuses of design that tight spaces allow. 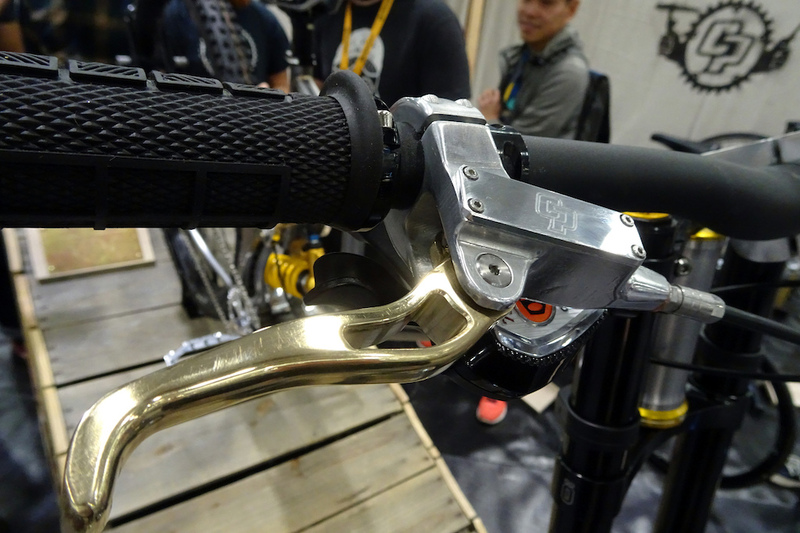 So they were able to make a metal crank pre-load collar...... see SRAM and Race Face, it can be done. I wish I could upvote this x 1,000. How that plastic nylon collar ever made it out of the engineering / design phase blows my mind and makes me wish I could be a product tester!! So I had to try out every which way and the UK disti dug out the original alloy RF one from their parts bin (cheers for that again). Long long story short I ended up sanding down the nylon one and spaced out the bb cups with 1mm spacers (added 4 in all). I ensured 300% that the bb shell was faced perfectly. This was the mistake..the bb shell wasn't faced perfectly when I first assembled the bike which ended up loosening this lockring. So if that is what you are implying get those bb shells faced perfectly as they should be anyway. The design actually works well with either the alloy one or the nylon one. I do admit I don't like looking at the nylon one but somehow it ended up there in my experiments and will keep the alloy one for post Armageddon. Which brings me to the complaint of the design. I hate looking at the gap, hence I spaced out the bb cups and now I have perfect distance either side from the chainstays, no gap, and only 1/3rd turn to tighten the lockring. I have a couple of ideas that would greatly improve the design but someone would need to cough up money or invite me to a pub and pick up the bill. Oh Middleburn (or whatever you are called now) please add 165 and 160mm cranks please. @zyoungson: yeah it will still move if the bb Cup is just ever so slightly off. This is why I try and hire Cal Poly SLO grads instead of applicants from UCLA, Cal, Stanford, and others. They seem to know how to get things done from start to finish and don't show up living in the theoretical world. Amazing finished product. Well done to all involved. Go Mustangs. Isn't doing project like these really common in US universities? Back in 2005 I was racing the World Solar Challenge from Darwin to Adelaide and there were at least two US teams there. I think Michigan placed third, MIT placed sixth but that was still impressive with a heavily damaged car from a crash in qualifiers. We won (Nuna3, Delft, The Netherlands). But in our workshop there were so many projects going on. There was Wasub (a human powered submarine that won the race in Washington), there was the Formula Student race car (something between a go-kart and a race car). I was talking to someone from a more recent team (the WSC is every other year and in Delft we had a fresh team designing and building a new car for every race) and it seems there are many more projects going on right now. So yeah I would expect something similar going on in US universities too. @vinay: For some universities, like Cal Poly, it is. For others not so much. Many of the bigger, more prominent Universities focus on graduate studies and the theoretical work or research that brings in the money. Many of them couldn't care less about the undergraduate focused clubs and competitions. This is why you see a lot of the universities which focus on their undergraduate programs and more hands on oriented curriculums generally being more successful in competitions. There are always a few exceptions to the rule, such at University of Michigan, Cornell, and others in this case. @Fresh1: In our cases, it is typically something initiated by students. It is not trigged by the university. Obviously students do negotiate facilities (workspace, windtunnel, machinery) and we get advice from staff when we ask for it and obviously the university uses it for their promo, but that's it. So if the students want to do it then it is just going to happen. No one told us what to do but ourselves. Now we had it a bit easier as the first two teams had won the race too so we already had a name (though obviously we also felt the pressure). In this same year another Dutch university (Twente) had their first team, I suppose the process must have been the same. I think they placed 12th or so that year. But last race (2017) they placed second just after Delft so they came a long way. Speaking to other teams after the race, it seemed that they were overseen and guided by someone from their university. So yeah in these cases obviously it depends on the university initiatives. Anyone notice the guy with the moustache through the wheel spokes? That who I expect to see on a bike like this! I think moustache dude might be Gary Fisher. At least he looked about like that 5-10 years ago. @sspiff: Looks more like Chuck Texeira, industry legend. Agreed, 12+ turns per inch and pigtail the ends if you like your skin!!! I have a scar running most of the way up one of my fingers from someone not pigtailing some wire on a helo we were doing a gearbox change on.. Safety wire slices are no joke! @roninagent23: I am private sector.. Went to trade school and got a job with AS350s doing firefighting work. @sspiff: looks like him, but I don't think GF would be caught dead in jeans and t-shirt. Way to go SLO Boys! Very well thought out incredible it all happened in just one year! 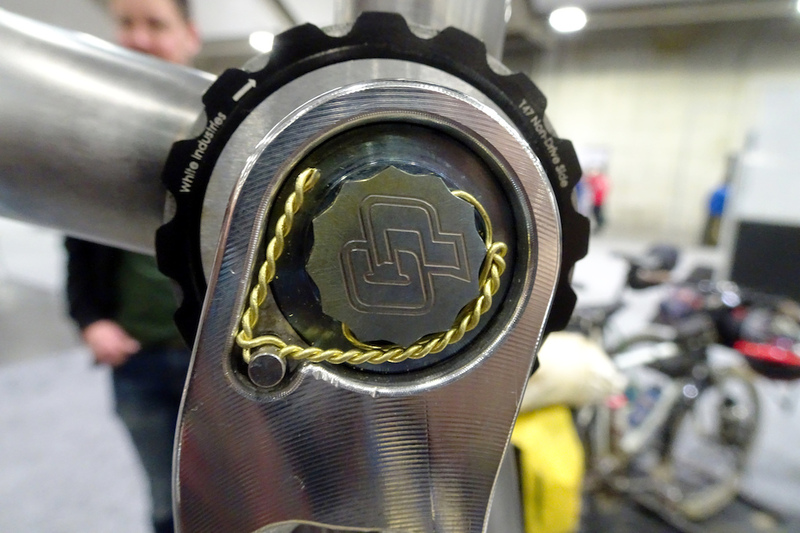 Rear dropouts remind me of the old Dan Baggs single speed that came out of the Poly bike club. From a product design perspective, it is an amazing piece of software. Better yet if it is for private use or you are small business (less than $100,000 per year) the software is free to use! Great work guys. I'm sure you are all very proud to finish a project with such an attractive design. The design and the construction are both really good. Are you going to take it racing? As a science teacher in California public schools, I gotta say Cal Poly provides what may be the best value in science and engineering education in the world (especially if you are a California resident). Building stuff and solving real problems from freshman year on is a rarity these days. I'm sure there are other schools like Poly, but the amount of kids they teach to really go out and make the world a better place is unique. They graduate more than 1500 engineers a year, who else does that AND has all the kids building by the end of their freshman year? Send your kids there if they can get in. Congratulations to the kids, but remember there are some unsung heroes providing that education. It's gotta be tough to make the choice to teach there when your peers are getting paid significantly more. Kudos to their professors! Looks great! A lot of cool detail work built into the components. I designed a trials bike frame for my senior project and did stress analysis but never fabricated it. My teammates both dropped out senior year so I was solo. I assume they used solid works with the now integrated FEA module. Pretty standard stuff these days that I’d wager more than a few of us have readily available. Yep Solidworks has Cosmos FEA built in now. Still stupid expensive per seat and I'm not sure the student version has FEA. As an aside, I have a ton of time on Solidworks and Autodesk Inventor using them both at the moment and it still amazes me that Solidworks is the default software in the industry wjhen Inventor is FAR superior in every way. Solidworks UI is like living in 2001. We're lucky enough to get Solidworks through the school. All Mechanical Engineering students get an academic license. For FEA, we did use the integrated solidworks FEA for some less critical parts (i.e. pistons in master cylinders). But for the frame and all critical components, we used Hyperworks and Abaqus. That's f@cking BadAss. group projects always sucked in college, that final product shows a high level of teamwork. no doubt. I teach at a local community college and we've canned all group work, mostly due to the plagiarizing illiterate international students... but that's another story. That CP master cylinder. Holy hell. Name your price. Big props to these guys for creating such a unique, cohesive design! 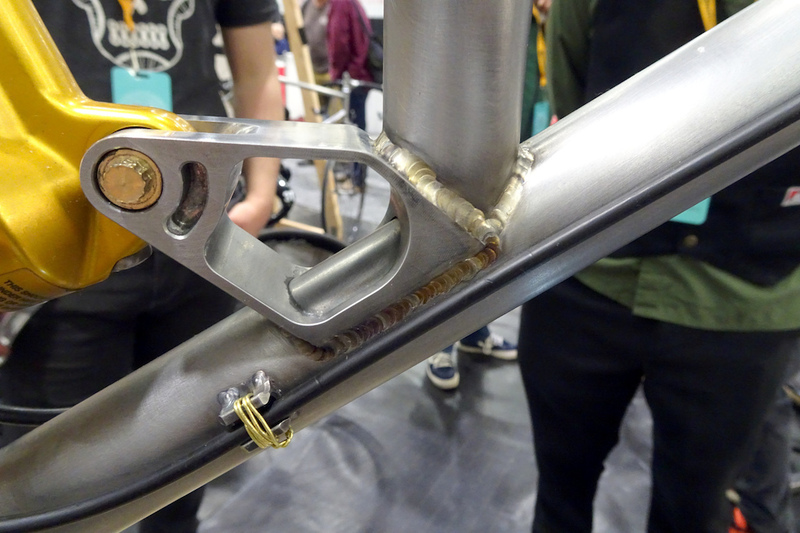 I really dig the shock mount / downtube / seat tube bracing; looks functional without being overly funky. Safety wire details are a sweet touch as well. I do like the wire locking. When it is in place, you know it is locked. If you use loctite, you'll still want to check every now and then with a torque key to see whether it is still tight, effectively damaging the loctite bond. @vinay: I don’t think he is complaining about the wire locking being there! I personal like that the option is there. But who ever did that needs to be taught how to wire lock as that isn’t locking anything!!! @hannjob: You're sure? If that bolt releases CCW and the wire stays in the plane shown then it shouldn't come loose. Actually as it has been twisted the right way around, even if it accidentally peels out of the plane then it still won't turn as that would require the wire to twist even tighter. Am I overlooking something? I've got to admit I don't have more experience with this type of locking than how it is being used on aircraft propellers where you have circle of bolts keeping each other tight or where the wire goes through a slot in the bolt and nut. @vinay: the correct way is for the wire to be passed through the bolt as it has, but the wire should be then passed around the top of the bolt from the right to meet the wire coming out the left side, passed underneath this wire to stop it riding up off the bolt. You then measure to the pin that your locking it to. You twist neatly and evenly until you reach this point. Pass through and around again. Then twist the opposite way until about an inch long and the final couple of twist you over libel rotate pulling it all tight. At about the half way point of the tail fold back on its self and push in direction of travel to again tighten. Sorry I’m an aircraft engineer who is very particular about my locking and hand skills. It is used on a lot more places over a prop. Helicopters are held together with the stuff. So where this person goes under the bolt and twists from mid way along and back on itself just wouldn’t cut it and can alone the bolt to twist within its locking. Sorry just re read that and should say from the left over the top to the right. @hannjob: Thanks. Yeah it's been a while since I've worked on an aircraft with a wooden prop which was held by a couple of bolts which were also locked with wire. But that was with multiple bolts in a circle, I wasn't familiar with the approach of how to do it on a single bolt. Thanks for the explanation! That is Awesome! Great overall aesthetics. 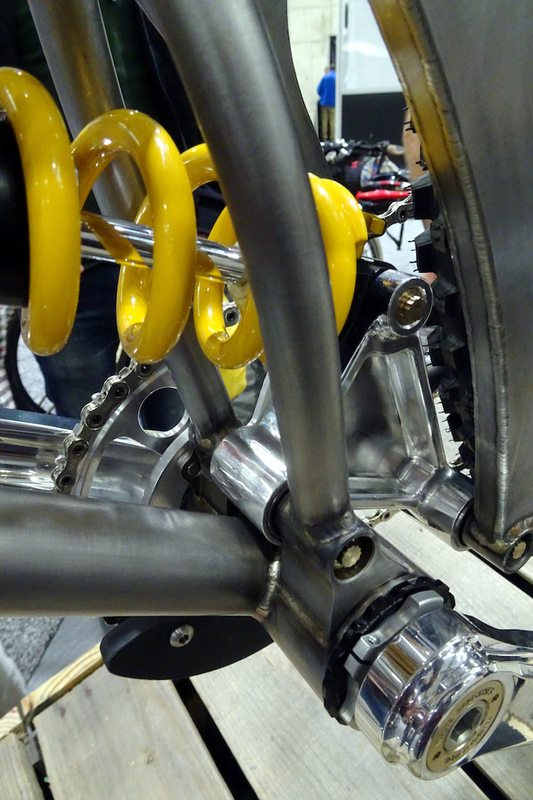 Cool to see a Steel FS bike with a more modern suspension layout. Way to go Poly. Now put that thing on the back of @BikeChurchShuttles big Yellow bus and go take that beast down Face trail! @Squeakybb: yes. And there's a lot more new stuff further out West Ridge. So it’s a steel V10? If the rear shock were mounted vertically in front of the seat tube, would it look like a session? I’m not downing the company or it’s efforts. What I am saying is; steel frames are absolutely nothing new. If the “masses” wanted them back, they’d have never left. And the rear suspension design is nothing new or creative. Santa Cruz and Intense have been milking this design for YEARS. There is absolutely no inovation here. None. At all. It’s a damn cool frame but that’s as far as it goes. So flame on, I’m calling it for what it is. @hmc499: This isn't a "company". This is a result of a few undergrad students' university course. WELL DONE ! I love steel frames and this one looks damn cool. I was curious about the pedal design. It looks like a good pedal wack is coming soon. Why would you build an offset spindle towards the front? 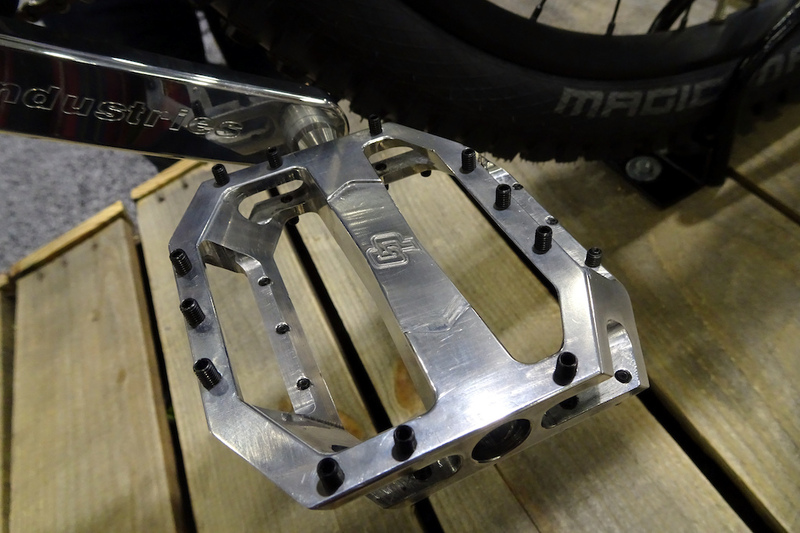 Are you asking, why, in general, do pedal companies offset them this way, or do you think that these are designed in the opposite manner of most others? In the close up pic, it looks like these peds are offset in the standard manner, with the spindle residing to the rear of center on the platform, so nothing unusual or atypical here. The common explanations I've heard for the design are to get more of your foot over the spindle while keeping the ball of the foot in the center of the platform, and to reduce the tendency of the pedal to roll under the foot when loaded in a front/back manner. 3 mustaches and no plaid, they clearly don't understand the Industry. Great work. If it ever comes into production I'd be interested! @Richardcunningham I can’t quite tell from the first shot; did they build their own stem, too? I dig it! Great teamwork. 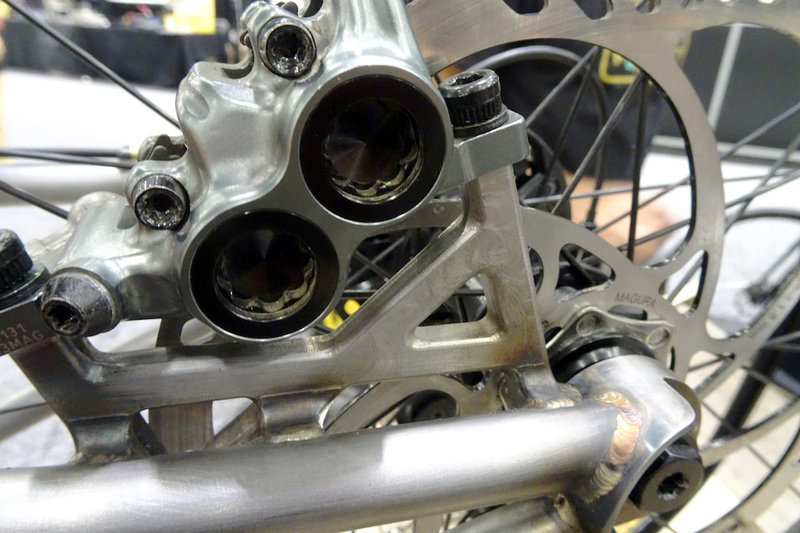 Clevis type pivot points are best practice on all suspension bikes regardless of material. Intense should take note of that. wow stunning look, very solid looking result! Two questions after reading this sweet article: 1) weight?, and 2) how much do these CAD programs cost? A Solidworks license (which is more than enough to do anything bike related) is $4k. I think they have deals for students as well. CAD programs cost about two to five years of school to understand them. @GorgeousBeauGaston: The student license is typically cheap as the whole point of these software companies is to get people hooked on that one program and make them reluctant to try something different once they set up their own company and have to buy their software. Same with for instance Microsoft Office. Student license is cheap, commercial license is like a ten fold. The student license allows them do pretty much anything they want but the files they create aren't compatible with the commercial versions and they're strictly prohibited to use it for anything commercial. @Sshredder: You could learn how to make something that looks like a bike within a month or so if you have some mechanical know-how and any kind of background with any design related program (even illustrator, photoshop, etc.). Making a bike that's actually good would take quite a bit longer. Getting into the materials, failure analysis simulations, etc. yeah that is going to take years. @vinay: Yeah Altium (on the EE side) does the exact same thing, they even have a free designer but it can only save to the cloud and it's own file format. Either way, if you are creative/computer savvy enough to teach yourself how to design a bike (or circuit board) on your own, chances are you can also find a way to get the top end software without paying the "full price". Just make sure if you are actually going to sell a product that you have your license in order. @GorgeousBeauGaston: 4k a year? Wow. That is like 10 times the cost of the Adobe Creative Suite. @GorgeousBeauGaston: yes that's why people go to school for years. You can make a picture of a bike with a simplified CAD program . That's a far cry from understanding dynamic loads and kinematiks when using CAD to design a bike. But Pink bike arm chair engineers are experts at building bikes right? @Rubberelli: Not a subscription price, you buy it you own the license. Tech support costs extra. They are always doing promotions too (at least my spammy reseller is). Solidworks is just one CAD program. During my study we used ProEngineer (like what you saw Jason Chamberlain use in the Specialized Demo9 promo/ad on the Collective video). During a project we started using Catia and I think the faculty adopted that program afterwards because it was a bit more advanced or at least for us, the output was better suited for aerodynamic simulations. I've personally never used Solidworks but at the end of the day most of these programs look alike. Deeper down it is different but just like with most word processors, if you can get along with MS Word you won't have too much difficulties working with WordPerfect, LibreOffice, OpenOffice, StarOffice etc. (or at least the word processors of these). Sure once you've become more intimate with the advanced/transparent options of WordPerfect using MS Word will become frustrating and the same may go for these pieces of CAD software. I can imagine the casually interested rider would like to play with this kind of stuff too and obviously commercial software is prohibitively expensive if it isn't going to make you money. You may want to look at the free or open source alternatives instead. FreeCad may be worth a look. I would instantly......very very nice. Rad, surely one of the builders could have popped out and got some cable ties. Why are there so many girls in the bike building club? Doesn't that suspension design somewhat resemble Canfield brothers Jedi? @gally-nh: He saved Latin, what have you ever done? Sorry i missed the college part, more power to him then! Where are the First Impressions??? Designed and built in high detail with input from 21 Cal Poly students. Many of whom are future engineers and they finish it up using hand twisted wire cable retainers. Were they going for "ironic"? I am sure you are aware that wire-locking is common practice in motorsport, aero etc, as they say it added a bit of 'steampunk' / fun to the look which obviously wasn't meant to be a ultra-polished / carbon / brightly coloured bike. @Mr-Horse en.wikipedia.org/wiki/Safety_wire its for FOD prevention/inspection and a good talking point for future interviews. All it takes is now is a quick look to know everything is tight. I'm just kidding guys. Lighten up a bit. I'm just waiting for DW to sue them. No sale, no lawsuit ????. i know youre joking, but this is definitely a VPP design.